Well, it’s that time of year. The sun is starting to shine up here in New England and I just can’t wait to get the Shelby on the road. I uncovered her and pulled her out of the garage today. It felt great. The Cobra legend was built on a small UK roadster fitted with a US V8. Now it’s back. Continuing the recent nostalgic trend of reworking ’60s cars for today’s market, a new Cobra may be on the way, reports Auto Express. 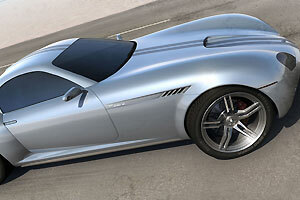 Concept images of the Cobra Venom V8 have surfaced, showing a car that retains the classic Shelby proportions. Although the resulting car will no doubt be less exciting to drive than the raw originals, it will supposedly get a supercharged Ford V8 pumping out 524 horsepower. That should be good for a 0-100km/h time of 3.4 seconds, on the way to a top speed of 342km/h. But there has been no confirmation as to whether the Venom project has (or will) move beyond the concept renderings. So I came up with 3 awesome ideas in the last week or so. Tell me what you think. 1) I was thinking that we should make a set of Shelby Trading Cards. Each would have a picture of the car with the pertinent information. The thought would be that they would be collector cards and a way for us all to remember a little about the cars. As many of my Shelby forum friends know, I had started a database where I was trying to list who had what since I couldn’t keep up. It was frustrating at times to be on the forum and want to say something about someone’s car only to have gotten it wrong now and then. I think this would be a great way to recall a little about each car. 2) I was watching TV this past weekend when I saw a little story about Camp Jeep. I thought it would be an awesome idea to have a Camp Shelby. 3) I have been really bummed lately that I didn’t go to Tulsa. I really wish I had. Now with Terlingua coming up soon, I really wish I could go to that but the gas, $2300 price and time away from my new job are keeping me home. So I thought that Shelby should have some kind of raffle or contest to let one or a few lucky people attend the event. I told Roger about each of these items so he could tell Shelby about them as he has been in contact with Amy quite a bit lately. I am hopeful that they jump on these ideas. In the name of ideas and databases, I will soon post a form for all Shelby owners to put information about their Shelby’s and post a picture. This will be in part for the Shelby Trading Cards and so I can also know who has done what to their cars. Stay tuned. 2) Topsfield, MA. NSOCC 39th Annual, topsfieldcarshow@nsocc.com. Jul 22-26 Marlborough, MA. Best Western, 181 Boston Post Rd. W. HET Club. Nov 2 Auburn, MA. Collector’s Toy Show. Elks, 750 Southbridge St. (Rt. 12). Seeing this is your old alma mater I hope this will be a fun day for you when you go there and show one and all what a fantastic Shelby you have!